Howard Ferguson famously gave up writing music when fashion turned against what he wanted to write. Other composers might have trimmed their style to match the mores of the times; not Ferguson. His catalogue is comparatively small and, as far as I can see, it has all been recorded. While his name was familiar as the pianist on those Finzi song LPs (review) and as the orchestrator of the Finzi Interlude (Conifer 75605 51285 2 with Nicholas Daniel and Vernon Handley, nla) his compositions are of commanding substance. It is better than good to see them being taken up by Raphael Terroni and his two collaborators. Terroni has never been fretful about tackling the periphery of the repertoire. His 1980s recording of the Cyril Scott Third Piano Sonata is an early example (BMS cassette - analogue - sadly never transferred). More recently he has recorded the two Cooke piano sonatas for Dutton. 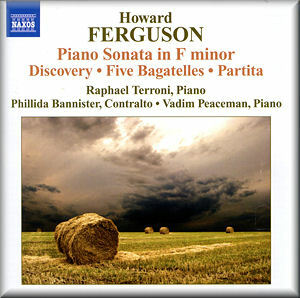 The Ferguson Sonata straddled the outbreak of World War II. Its three movements are not short on drama. This is the drama of craggy Lisztian heights but Terroni also stays in touch with the Chopin-style filigree. The reflective moments glow with a Finzian quality I had never heard in this work before. I hope perhaps that one day Terroni will be able to record the Finzi Eclogue and also the Grand Fantasia and Toccata so sensationally despatched by Leon McCawley at the 2009 Proms. The poetry of Denton Welch (1915-48) is set by Ferguson in the compact five song cycle Discovery which was also recorded by Kathleen Ferrier. The often dark twist of the words is reflected in songs which have little surface glamour. You need to be in the right mood. The most moving is Babylon which is in the spirit of Holst's Betelgeuse and Finzi's Stars over Yelland. Jane Allen reminded me of Moeran's Shakespeare Songs and Foulds' Phantom Horseman. The Five Bagatelles were written from the five note cells provided by the South African composer Arnold Van Wyck whose own Symphony and Saudades for violin and orchestra need attention in the studio. These pieces were taken up, as was the Sonata, by Myra Hess and she made the first recording of the Bagatelles which was issued on 78. They are varied and entertaining little character slivers. I liked the dark waters frequented by the Molto moderato - Chopin refracted through an ominous 20th century glass. Vadim Peaceman joins Terroni for the 1935-36 Partita which Ferguson wrote simultaneously in two piano and orchestral versions. The four movements have the rhetorical grandeur we find at the start of the Piano Sonata, a touch of ‘baroquerie’ and a romantic almost Hollywood (psychological Rozsa) subtext in the artfully stumbling Andante. The crystalline gambolling finale touches more on Rachmaninov than on the Baroque. The music is superbly turned and clipped by the two pianists and given real joie de vivre - a feel-good finale. This is a most attractive recital with Discovery lending contrast. The helpfully deepened notes are by Richard Whitehouse. How about an orchestral collection please Naxos with the wonderful jobbery that is the snappily Waltonian Overture for an Occasion and the Two Ballads and Four Diversions on Ulster Airs. Naxos have already given us the Piano Concerto (review). Then again there are the two grand choral-orchestral works A Dream of the Rood and Amore Langueo.